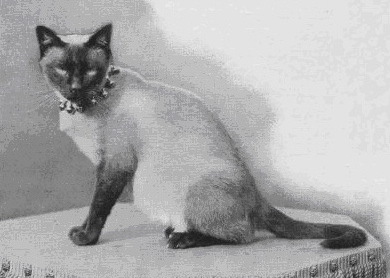 Der erste Rassestandard für Siamkatzen, die man damals noch als "Royal Cat of Siam" bezeichnete, wurde 1892 von Harrison Weir erstellt und 1902 nach Gründung des Siamese Cat Club stark erweitert. Allerdings war nur die Farbe sealpoint anerkannt. Weitere Anpassungen des Standards erfolgten durch diegroßen nationalen und internationalen Dachverbände der Rassekatzenzuchtorganisationen im Laufe der folgenden Jahrzehnte. 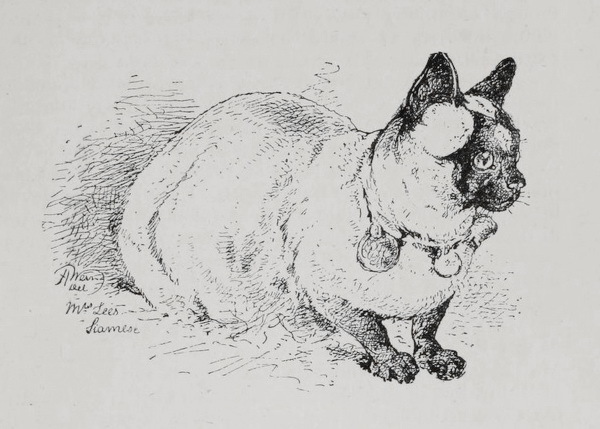 The head should be long from the ears to the eyes, and not over broad, and than rather sharply taper off towards the muzzle, the forehead flat, and receding, the eyes somewhat aslant downwards the nose, and the eyes of a pearly, yet bright blue color, the ears usual size and black, with litte or no hair on the inside, with black muzzle, and round the eyes black. The form should be slight, graceful, and delicately made, body long, tail rather short, and thin, and the legs someone short, slender, and the feel oval, not so round as the odinary English cat. The body should be one bright, uniform, even color, not clouded either rich fawn, dun or ash. The legs, feet, and tail black. The back slightly darker is allowable, if of a rich colour, and the colour softended, not clouded. As light and even as possible, cream being most desirable, but fawn also admissable, without streks, bars, blotches, or any other body markings. i.e., mask, ears, legs, feet, and tail, dark and clearly defined, of the shade known as „seal“ brown. 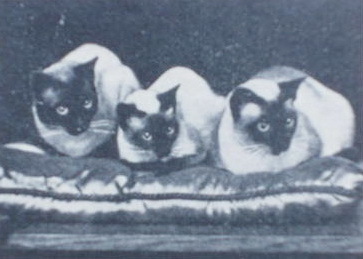 Complete, i.e., connected by tracings with the ears, neither separated by a pale ring (as in kittens) nor blurred and indistinct, the disideratum being to preserve the „marten“ face, an impression greatly aided by a good mark. Body rather long, legs proportionately slight. Medium in size, body long and svelte, legs proportionately slim, hind legs slightly higher than front ones, feet small and oval, tail long and tapering (either straight or slightly kniked at the extremity). Head long and well proportioned, with width between the eyes, narrowing in perfectly straigt lines to a fine muzzle, giving the impression of a marten face. Ears, rather large and pricked, wide at the base. Clear, bright and decidedly blue. Sharpe oriental and slanting towards the nose. No tendency to squint. Cream, shading gradually into pale warm fawn on the black. Kittens paler in colour. Mask, ears, legs, feet and tail dense and clearly defined seal brown. Mask complete, and (except in kittens) connected by tracings with the ears. Very short and fine in texture, glossy and close lying. Compare this with the first standard of points issued. Der Körper ist von mittlerer Größe. langgestreckt, schlank, gut muskulös, dabei jedoch elegant in der Gesamterscheinung. Die Schultern sind nicht stärker als die Hüften. Der Hals ist lang und schlank. Die Beine sind lang und gut proportioniert zum Körper. Die Füße sind klein und oval. Der Schwanz ist sehr lang, dünn am Ansatz und in einer feinen Spitze endend. Der Kopf ist von mittlerer Größe, keilförmig und zum Körper gut proportioniert. Der Keil fängt an der Nase an und verbreitert sich allmählich an beiden Seiten in graden Linien zu den Ohren. Die beiden Linien sind ununterbrochen, also ohne „Whisker break“. Die Ohren sind groß, zugespitzt, breit an der Basis und verlängern die Seiten des Keils. Der Schädel ist von der Seite gesehen leicht konvex. Die Nase ist lang und grade und verlängert die Linie der Stirn ohne „break“. Die Schnauze ist fein ausgebildet. Kinn und Kiefer sind von mittlerer Größe. Das Ende des Kinns bildet mit der Nasenspitze eine vertikale Linie. Die Augen sind von mittlerer Größe. Sie sind mandelförmig und leicht schräg gestellt und stellen damit die Harmonie zur Keilform des Kopfes her. Die Augen sind weder zu tief liegend noch hervorstehend. Die Augenfarbe ist bei allen Siamkatzen von reiner klarer Farbe in leuchtendem, tiefem Blau. Das Fell ist sehr kurz, fein, glänzend und matt anliegend. Die Körperfarbe des Fells ist gleichmäßig, leichte Schattierungen auf den Flanken sind erlaubt. Zwischen der Körperfarbe und den Abzeichen besteht ein guter Kontrast. 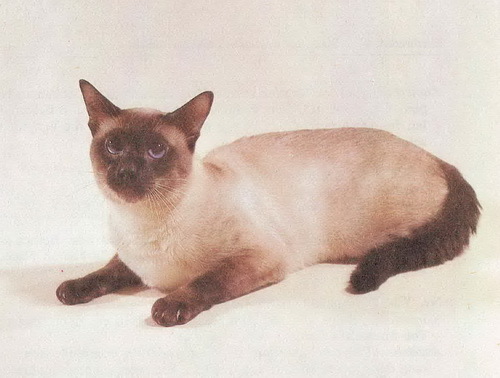 The ideal Siameze is a medium sized, svelte, refined cat with long tapering lines, very lithe but muscular. Males may be proportionately larger. Balance and refinement are the essence of the breed, where all parts come together in a harmonious whole, with neither too much nor too little consideration given to any one feature. medium size. Graceful, long, and svelte. A distinctive combination of fine bones and firm muscles. Shoulders and hips continue same sleek lines of tubular body. Hips never wider than shoulders. Abdomen tight. LEGS: long and slim. Hind legs higher than front. In good proportion to body. PAWS: dainty, small, and oval. Toes: five in front and four behind. TAIL: long, thin, tapering to a fine point. Long tapering wedge. Medium in size in good proportion to body. The total wedge starts at the nose and flares out in straight lines to the tips of the ears forming a triangle, with no break at the whiskers. No less than the width of an eye between the eyes. When the whiskers are smoothed back, the underlying bone structure is apparent. Allowance must be made for jowls in the stud cat. SKULL: flat. In profile, a long straight line is seen from the top of the head to the tip of the nose. No bulge over eyes. No dip in nose. 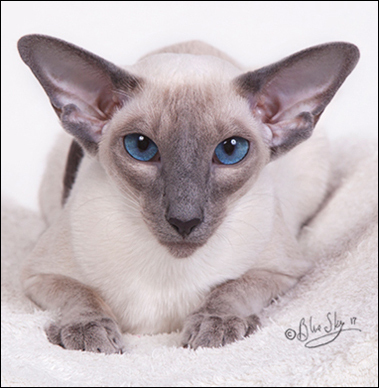 EARS: strikingly large, pointed, wide at base; continuing the lines of the wedge. NOSE: long and straight. A continuation of the forehead with no break. MUZZLE: fine, wedge-shaped. CHIN and JAW: medium size. Tip of chin lines up with tip of nose in the same vertical plane. Neither receding nor excessively massive. almond shaped. Medium size. Neither protruding nor recessed. Slanted towards the nose in harmony with lines of wedge and ears. Uncrossed. COAT: short, fine textured, glossy. Lying close to body. CONDITION: excellent physical condition. Eyes clear. Muscular, strong, and lithe. Neither flabby nor boney. Not fat.